Got a decent amount done today I guess? Camera system now has 3 modes that the player can switch between: "fixed", "smooth", and "grid" (inspired by classic Zelda). Made HUD more minimal. Before with the bigger HUD you couldn't see where you were going when travelling vertically using the "gird" camera. I also made it go half opacity when player is at the top or bottom of the screen, to minimise issues with the "grid" camera even further. Changed my font from monospaced to proportional. 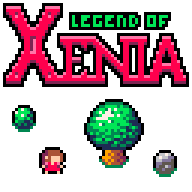 Made a few more sprites, implemented collisions, and tried my hands on a logo. Also obvious inspiration from Zelda, lol. Might as well steal everything now that I'm at it! I love the Zelda style font on the title you've got going, very fine work.